When teenager Maryanne Doyle disappears in 1998 it becomes impossible for Cat Kinsella to look at her dad in the same way. She knows he lied to the police about knowing Maryanne and that he never mentioned the encounter to her mother but did that make him a kidnapper or murderer? Cat never had any proof but when a body of a woman going under the name of Alice turns up just a stones throw away from the pub her Dad is currently running, and she is involved in the investigation, she fears her family secrets will come pouring out and she will have to confront the truth. 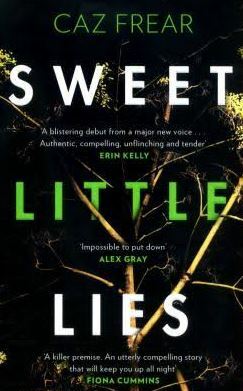 It’s a truth that unravels in front of the readers very eyes in Caz Frear’s Sweet Little Lies. But then something throws Cat and the whole investigation off track. Alice turned up on Brighton beach in the early 2000’s and ended up marrying a guy and trying desperately to have a child via IVF. But Alice was a made up name and her body had previously carried a child. But how did she end up in Brighton, what or who was she running from and who really was she? The police department don’t know how to react, Cat doesn’t know who to turn to and the Kinsella family becomes increasingly strained. Throughout the entire book Cat is battling with a work assigned therapist to help her get over being involved in a murder case, she’s drinking and smoking weed to get through her time off shift, her sister is disgusted by her behaviour and her brother suddenly reappears in their dad’s pub. It’s nearly Christmas and it looks like there is no chance of the investigation getting solved any time soon but Cat has promised to attend the family dinner and it results in an explosive dinner time with relationships reaching breaking point. Cat becomes increasingly convinced that it had to be her Dad that was going around kidnapping and/or murdering people but what the police investigation discovers that Christmas and New Years is a much deeper and darker story than anybody could have imagined when the body of a woman mysteriously turned up one cold morning in a residential area of London. It really felt throughout the book that I was going on the entire journey with Cat and experiencing all the emotions and conflicting emotions with her; the moments of sadness at discovering a dead body, the moments of anger as she recalls the past, the moments of uncertainty and desire as she finds herself falling in love with a suspect and so much more. The twists, turns and shocks were constantly appearing, in such subtle ways, but they were weaved into the story in a believable and enjoyable way. Whilst the story is a shocking one, a real on the edge of your seat thriller, it is one that you could easily image being a real life situation that the London police departments might have to deal with and especially when a much wanted criminal is thrown into the mix as well as it heightens the senses of the story to being much more than just a whodunnit and romance novel to a nightmare of a crime ring past. It certainly isn’t the sort of book that would suit everybody, it could prove to be too much of a nail-biter for some, but for the people that are into modern day thrillers with realistic locations, believable family tensions and hidden secrets that are waiting to come out in the form of gang violence and murder this is a real gem of a book. You can see why this book has gone on to become an international bestseller and is still very much promoted by the publisher Bonnier Zaffre. If you have read this book I would love to find out your thoughts in the comments below! Remember you can follow me on Goodreads to see what I’m currently reading. This entry was posted in Books, Culture and tagged book, book blog, book blogger, book bloggers, book review, Books, Caz Frear, crime, criminal ring, detective, family, fiction, lblog, lblogger, lbloggers, life, Lifestyle, lifestyle blog, lifestyle blogger, lifestyle bloggers, London, modern book, murder, murder mystery, mystery, police, review, story, Sweet Little Lies, thriller. Bookmark the permalink.